Movies and cars have a long, rich relationship. They were both invented and refined at virtually the same time, and from chase-scenes to drive-in theatres, the two have become inseparable. Yet some films make such expert use of cars that the vehicles become central characters unto themselves. We have an office full of cinephiles and car-nuts, and after a lengthy debate, we are proud to present our list of the top-five Fords on film. When you think of James Bond’s cars, Ford likely isn’t the first name that comes to mind. England’s most-notorious superspy has favored Aston Martins since 1964’s Goldfinger. 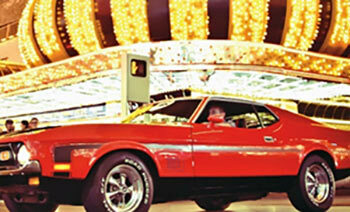 But when Diamonds are Forever took 007 to the United States, he flexed some American muscle in a red Mach 1 Mustang. At least 6 Mustangs were used for the film, but none are more famous than the car that went on two wheels to evade police down an alley. Gone in 60 Seconds is an ode to the beauty of the automobile through the lens of an ambitious car thief. The film follows Maindrian Pace, an insurance investigator who moonlights as the leader of a ring of car thieves, as he attempts to satisfy an especially demanding client. 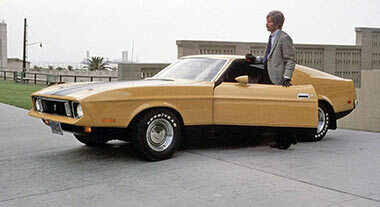 Pace has to steal 48 hard-to-find cars in five days, but the most difficult vehicle on the list ends up being a yellow Mustang, nicknamed “Eleanor.” The car plays such a crucial role in the movie that it is the only Ford Mustang to receive a star title credit in a film. 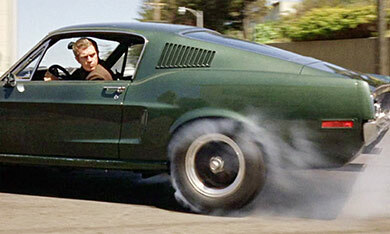 Bullitt is in some ways still the gold standard for car movies. Steve McQueen personifies cool, and part of that reputation comes from his turn as SFPD Lieutenant Frank Bullitt. Bullitt’s pursuit of hit men driving black ’68 Dodge Charger R/T is one of the most iconic chase scenes ever, and it features close-ups of the driver for the first time in film history. The Highland Green Mustang from the film is such a cultural touchstone that Ford released a special-edition Bullitt Mustang for the 40th anniversary of the film’s release. Mad Max imagines our favorite kind of dystopian future: one in which cars are king. 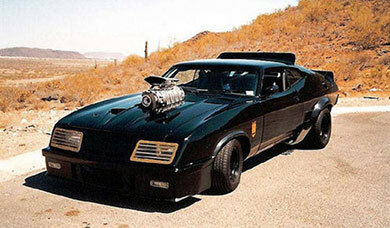 In a post-apocalyptic future in which highways are a battleground and gasoline is a precious commodity, the “Pursuit Special” Ford Falcon given to Mel Gibson’s Max Rockatansky is a star in its own right. Hailed as the last of the V8s, Max’s Interceptor is the great equalizer in a war against vicious gangs set on breaking down the last traces of civilized society. There is maybe no movie car that has had a greater impact on the automotive industry than the 1932 Ford Coupe from George Lucas’ cult classic about teen life in the 50s and 60s, American Graffiti. 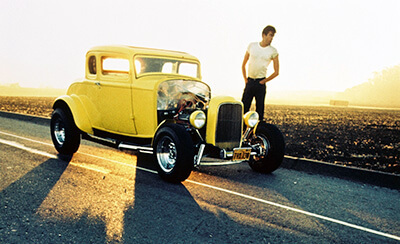 The bright yellow five-window, described as the fastest thing in the valley, was not originally intended to be a focal point of the film, but the Ford Coupe inspired moviegoers nostalgic for their youth to modify vintage cars and helped to inspire the modern hot rod movement. At Butler Automotive, we love movies – second only to cars, trucks and SUVs – and would love to hear from you if you think our list has a glaring omission. Please like us on Facebook or drop by our dealership and let us know!